Daytona Beach, Fla. – There weren’t many wrecks in Thursday’s Gatorade Duels, but they still were considered exciting races by most of those who really watched it. From the top of a transporter in the garage area, it was readily apparent that once the tires became worn, drivers were really struggling to maintain control. There was passing aplenty, even though the Duel fields are small in comparison to a Cup race, and the outcomes of both races were in doubt until the winners’ car numbers appeared atop the scoreboard at the end. Jimmie Johnson’s margin of victory over Kevin Harvick in the first race as a scant .005 seconds and Kasey Kahne won the second by just .014 seconds over Tony Stewart. Michael Waltrip, who watched the second race with great interest as his Daytona 500 starting spot was on the line, said that with his personal interests factored out, it was a great race from an educated spectator’s standpoint. “I know how hard it is to do what Brian Vickers and Kurt Busch and Kasey Kahne (were doing),” he said. “They’re running 185 miles an hour sideways, two‑wide, threatening to be three‑wide, bumping, passing. I’ve never seen anything more exciting in my whole life than that 125 right there. And he said fans need to understand that. “I just think we have unrealistic expectations at times about what we can do with a car,” he said. “I challenge you to look back over the history of NASCAR, the sport that grew from a southeastern regional sport to the juggernaut that it was throughout the O’s, and show me when a race was better than that. New Riggs Gig: What a difference a year makes for Scott Riggs. On Thursday morning, he had an Allen wrench in his hand and was hard at work in the Nationwide Series garage, helping his Robbie Benton-owned team prepare the No. 09 Ford that he’ll attempt to qualify on Friday. A year ago, he was one of the heroes of the day as he secured a prized Daytona 500 starting spot for Tommy Baldwin’s shoe-string-budget team. Riggs said that while he’d obviously rather have a top-notch ride over in the Cup garage, he was content with his new team. Even Riggs seemed to be sharing in the youthful enthusiasm of the crew, even though at age 39 he’s much older than most of them. “They call me grandpa,” he said. Riggs was 23rd fastest in Thursday’s practice session but predicted he’d be able to improve on that. He’ll have to if he wants to race. Like Baldwin in Cup last year, Benton comes to Daytona without a guaranteed starting spot. Ripple Effect: The Nationwide teams that stand to get the benefit the most from Danica Patrick’s participation this year might be those that are parked near Patrick’s No. 7 Chevrolet. On Thursday, as Patrick made her way through the throng that follows her, young Trevor Bayne was essentially shoved out of the way. Bayne took the slight in stride, saying he’d heard similar comments from Motorcross legend Ricky Carmichael after he and Patrick ran last week’s ARCA race. 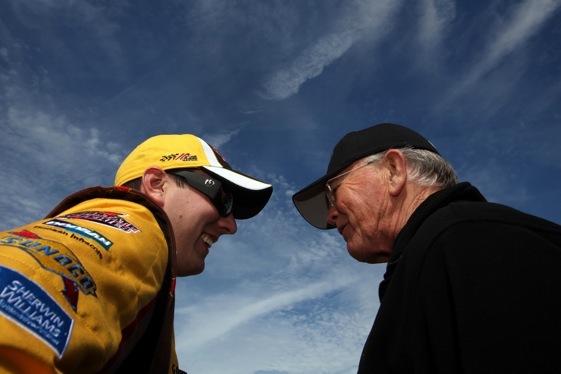 “I told Ricky, ‘That’s how I feel when you come around,’” Bayne said. Suspended: William Wheeler, a crew member for the No. 57 team in the Camping World Truck Series, has been indefinitely suspended from NASCAR for violating the sanctioning body’s substance abuse policy.